In diesem Bericht, wollen wir unser Hautaugenmerk, auf das Vorurteil mit der Pflege eines Plexiglasgehäuses richten. Natürlich gibt es Fotos und unsere Erfahrungen,beim Aufbau eines solchen Plexiglascases. Viel Spaß mit unserem Bericht. Techbits has reviewed the newest Zire 71 in Palm's product line-up. The Zire 71 integrates a digital camera and is an excellent PDA in the sub $300 range. The first time a saw a pre-modded case for sale was atleast a year ago. These days, the price of a stock and a pre-modded case are almost the same! With so many different styles and colors, one of the biggest questions when customizing a case is, "Where do I start?" In my opinion, a pre-modded case is a good structure to add more personalized mods to. Buying pre-modded helps saves time, and ensures your case will have a professional construction to it. Today I am taking a look at the "X-Dreamer" pre-modded case. It's features and design look promising, but how well will it actually function? 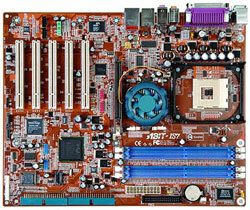 The IS7 BIOS "Advanced Chipset Features" give the user a wide range of options to tune the memory. The mighty ABIT "Game Accelerator" is residing here as well. ABIT made headlines with the introduction of this technology, because it is supposed to make the 865PE chipset based IS7 as fast as 875P boards. The "Game Accelerator" has 3 pre-defined performance settings, "Turbo" being the lowest stage of acceleration, followed by "Street Racer" and "F1" as the most aggressive performance setting.